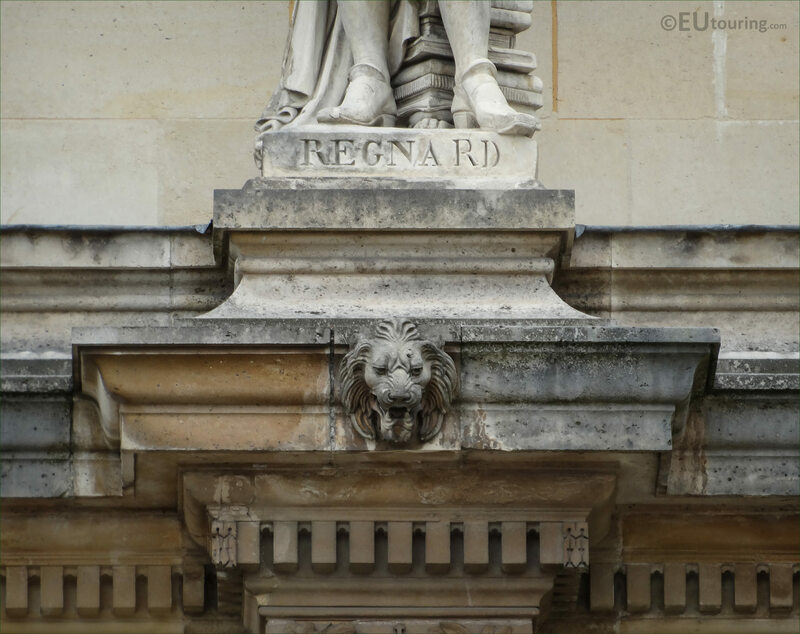 We took these high definition photos showing the statue of Regnard by Theodore Gruyere while we were in the Cour Napoleon of the Musee du Louvre looking at the facade of the Aile Henri II, which is located in the 1st Arrondissement of Paris. 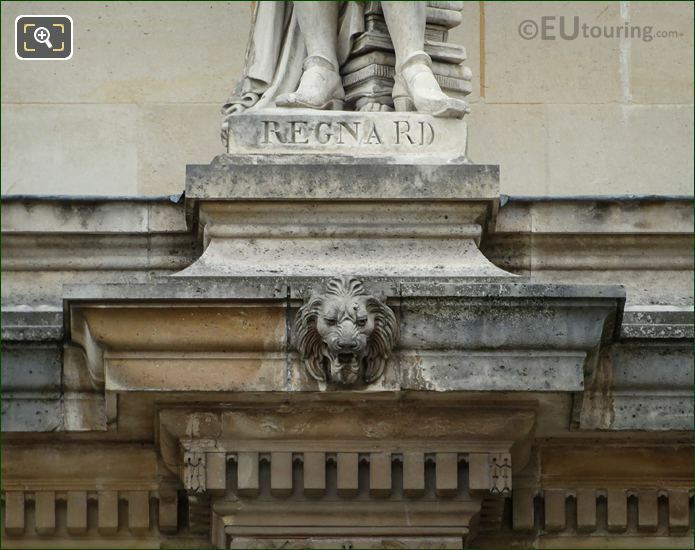 So this first photograph shows the full stone statue of Jean-Francois Regnard, which is located on the first level balustrade of the Aile Henri II, and this is positioned as the third statue from the left hand side as you are looking at this facade next to the Pavillon Sully. Now, this statue was sculpted by Theodore Charles Gruyere who was born in Paris on 17th September 1813, and becoming a French sculptor he entered the Ecole des Beaux Arts and started presenting his works at Paris Salons for French artists. This led to numerous different commissions for historical buildings Paris, when they were being adorned with ornamental statues, and he produced several for what was then called the Palais du Louvre including this one within the series of famous men in the history of France, prior to passing away in 1885. 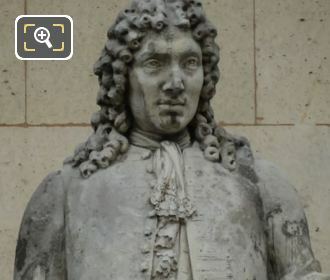 And in this close up HD photo you can see the base of the statue, which is dedicated to Jean-Francois Regnard who was born to a wealthy family on 7th February 1655 and having had an excellent classical education, when he inherited his fathers fortune, it meant that he could travel. 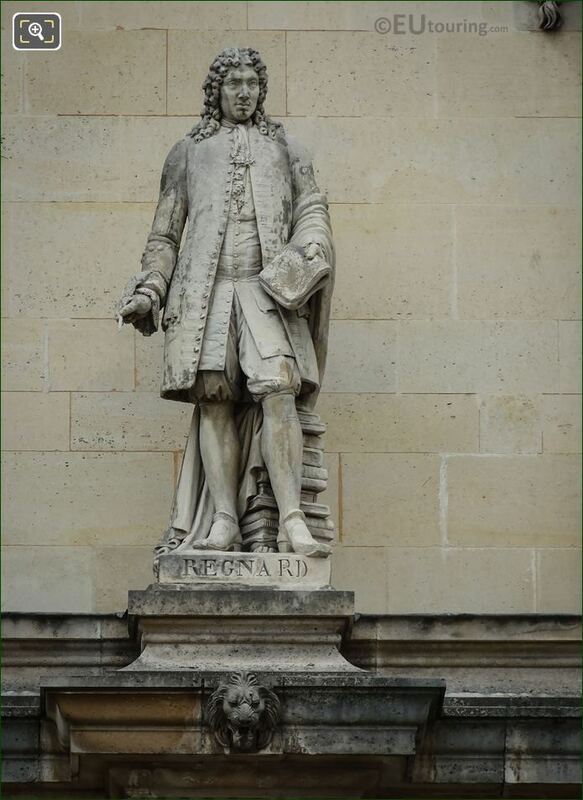 Jean-Francois Regnard became one of the most distinguished poets at the time, writing farces, skits and then comedies in verse for the Comedie Francaise, yet it was his accounts and diary that he wrote on his travels prior to becoming a poet, especially those from 1681, which have now made him even more famous. 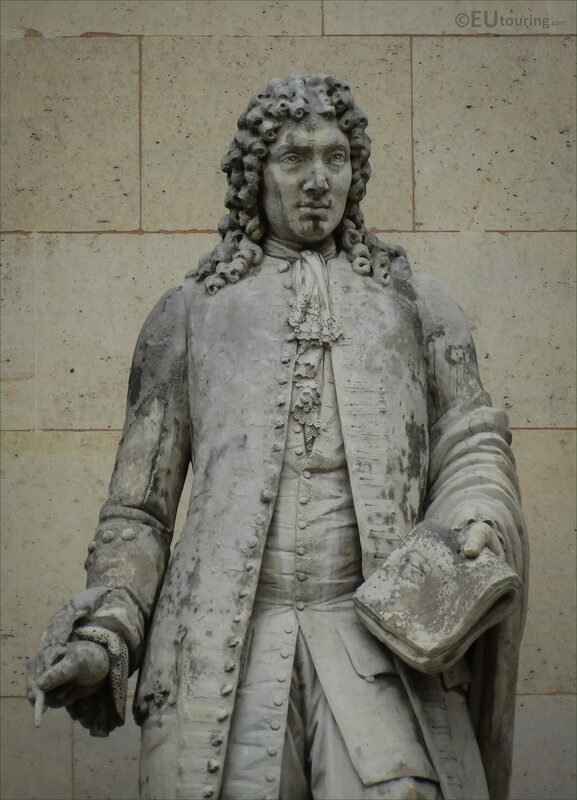 And spending time between his mansion in Paris and the family country estate, he passed away at his chateau near Dourdan on the 4th September 1709, but the voyages with his descriptions of the Sami tribes of Lapland were not published until 1731.